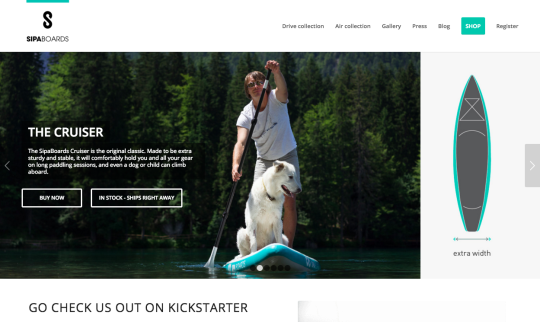 At first, Slovenia seems like an unlikely spot for an innovative stand-up paddleboard (SUP) manufacturer like SipaBoards to set up shop—even an online stand-up paddleboard manufacturer. That’s the kind of business you’d expect to find in Southern California, Australia or Fiji. Think again. Slovenia, a small country in Central Europe adjoins Italy, Austria, and Croatia, nestling close to the warm Adriatic Sea. And Slovenia is famously known for outdoor recreation. River rafting, for instance. Triglav National Park in the Julian Alps offers some of the best rafting in the world along the Soča River, famous for its crystalline aquamarine water. Lots of great paddleboard opportunities! Two years ago, in 2014, Sebastjan Sitar, was out with his family enjoying a pleasant afternoon on the water. He would end up being SipaBoards’ CEO. With or without jet engines, stand-up paddleboarding may well be the world’s fastest growing sport. Whether you visit Bayou St. John in New Orleans, or the Berkeley shoreline in the San Francisco Bay Area, you will probably notice what looks a lot like people walking on the water. They’re not walking; they’re paddling their stand-up paddleboards. And there are more of them every day. The appeal is easy to understand. Let’s say you work ‘til 5 o'clock every day, and then you want to do something for yourself. Some jogging, some exercising – but family time is always in short supply, so you want to do it with your family. This is one of the biggest advantages of the powered (or unpowered) SUP. You can go out with your kids, you can paddle without jet assist while they use the engine. So there you are, hanging out with your kids, enjoying the scenery, and you’re doing your exercise too. There’s only one catch. Well three catches. First, hard paddleboards are big, and most European apartments are small. Where do you store three or four SUPs? Second, there’s the part where you get stuck in a nasty current. Third, there’s the part about schlepping all those boards down to the water in your compact car. SipaBoards offer innovative solutions to these three challenges. All their boards (both the Air and Drive models) fold up into small, easily-storable (and drivable) packages, and self-inflate when you get to the water. Some of the boards (the Drive collection) include built-in engines as well, while others (the Air collection) deliver the self-inflating technology without the engine – at a lower price point. Fortunately for the start-up, once Sitar was sold on the boards he was able to bring a lot of business experience to the table. Even before his aha moment (when his wife and kids nearly floated away on their un-powered paddleboards) he had been a successful sports shop owner. Starting as a ski competitor himself, he ran his store happily until things got too hectic. “Too many things to do,” he laughs. partly to see if it actually worked, and partly so they could go out and ask people what they thought. They did promotions, they got feedback, and the reactions were super. Even professional SUP guys liked it. Maybe that’s one reason SipaBoards’ Kickstarter campaigns (Drive and Air) were so successful. And then in 2015 they won a prestigious Red Dot Design international product design award – Best of the Best! 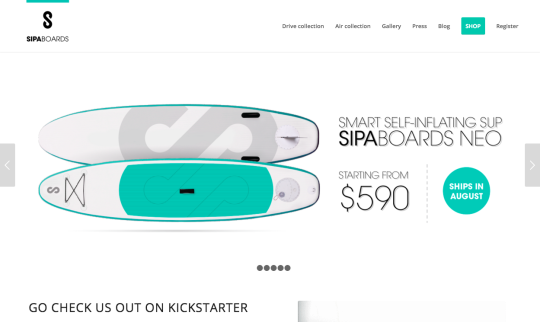 Selling large, heavy items like paddleboards on-line is not totally intuitive, but SipaBoards knows how to make it work. To some extent they have to: 80 percent of their sales are in the mainland United States. Shipping from Slovenia to the States? No problem! Yes, it costs between $80 and $100, but that doesn’t seem to be slowing sales. Perhaps that’s because the customer service is so good. Someone from Customer Support is on-line almost all the time. At least one full-time staffer is totally dedicated to customer service. The idea is to get answers back to customers as quickly as possible. Some problems can be solved by phone, or by email. If there’s a problem that can’t be solved from a distance SipaBoards sends replacement parts directly. It’s rare for customers to have to return the board.